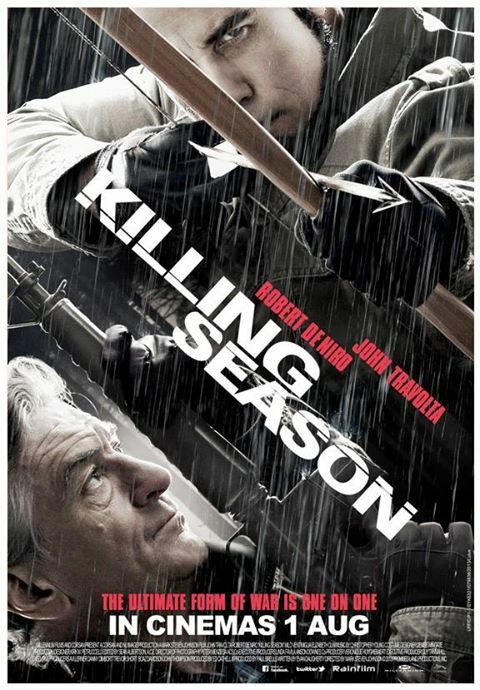 Synopsis: Killing Season tells the story of two veterans of the Bosnian War, one American, one Serbian, who clash in the remote Rocky Mountain wilderness. FORD is a former American soldier who fought on the front lines in Bosnia. When our story begins, he has retreated to a remote cabin in the woods, trying to escape painful memories of war. The action begins when KOVAC, a former Serbian soldier, seeks Ford out, hoping to settle an old score. What follows is a cat-and-mouse action games in which Ford and Kovac fight their own personal World War III, with battles both physical and psychological. Verdict: Starts off intriguingly, does okay in covering the lack of production budget, and enjoyable performance by both the lead actors as well, especially John Travolta with his fake Serbian accent, but as the characters get more illogically incompetent, the movie gradually becomes relatively stupid towards the final third. This revenge plot’s not exactly fresh and the length of the film’s a bit too short resulting an unsatisfying amount of action and gore. Not to mention, the disappointingly simple, corny closure. With that being said, if it weren’t for Travolta and Robert De Niro, Killing Season may have been quite unwatchable. However, if you’re sick of the commercialised, mainstream summer bullcrap the cinema has been releasing the past few weeks, you might wanna check this out. Second opinion: “Too painful to watch” (girlfriend). Malaysian censorship: I don’t know if anything’s cut ’cause this was already released a month ago on US home screen so I watched it online at the comfort of my own room. There’s only like one or two very brutally graphic scenes but there’s also plenty of vulgarity which our local censorship board may happily cut. Just how gory is it? Refer to the spoiler section below. Scenes that are gory or more violent than average & a bit illogical: There are only like three actually. Benjamin Ford (Robert De Niro) takes an arrow through his calf and pulls it out by himself then is told to put a stake through that hole of his calf, tie its rope tight and with that, gets his whole body pulled up and hung up upside down while his calf carries all the weight. 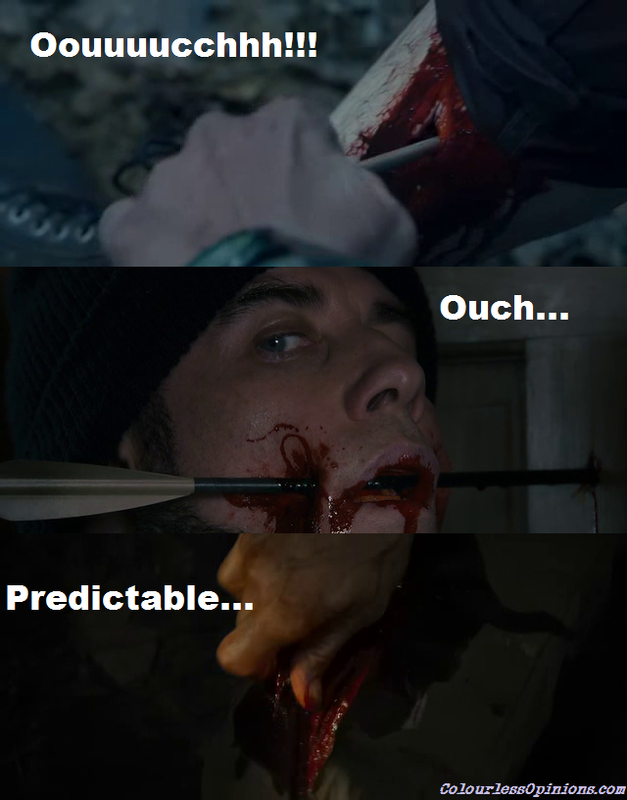 The next one’s not as gruesome, Emil Kovac’s (John Travolta) turn to take an arrow but it’s through his cheeks. This scene may be flawed ’cause he gets shot when he’s standing straight but later it’s shown that he got hit when he’s halfway falling down. And for unknown reasons, he doesn’t do anything and just allows Ford to just capture him to torture him back in return by pouring lemon and salt into his injured mouth. Then the last one is the least gory one of all and it’s also kinda stupid. Kovac is about to shoot Ford at the back from point blank but Ford tells him to look him in the eye and he accepts his request without suspecting that he’d try something. He walks around him without any caution even though he knows what Ford is capable of. Ford pulls out the shrapnel from the inside of his wounded thigh and attacks Kovac with it. Pretty dumb scene. And that’s about it. A relief to my girlfriend who was watching with me, a disappointment to me. I cringed during the thigh and lemonade scenes. Really painful to watch. Still cringed when I recall those scenes. Bluerghhh.